(You may have been directed here from www.ke0og.net) You’ve landed on my ham radio home page. I’m KEØOG, an Extra-Class ham radio operator. I’m active on HF, 2-meters, and 440 MHz. I use this page as an index to ham-radio-related material on this site. This chart shows various geomagnetic indicies and what the sun looks like now. These indicies show what HF propagation is like right now. You can use data like this to help you find a good HF band for operations. You can refresh this page to get the latest data. The three amateur (ham) radio license classes. Some background material on license grades, the difficulty of the test, and the operating privileges. Videos to aid your self study for your ham radio Technician Class license: Technician Class Ham License – On-Line Help for Your Self Study, which you can also access directly from www.ke0og.net/training. The purpose of this series of videos is to talk you through the self study you’ll be doing with the ARRL Ham Radio License Manual. There’s one video for each section of the book, on the theory that it’s easier to study if someone’s given you a little overview. How much does it cost to become a Technician Class (entry level) ham? How much does it cost to upgrade to General or Extra Class and get on HF radio? What do I do once I become a ham? Using a rubber stamp to turn a spiral-bound notebook into a logbook. My new Yaesu FTdx3000. I review my new FTdx3000. Great radio! New addition to my shack: Oak Hills Research OHR100A 5-watt (QRP) CW 20-meter-only transceiver. See my notes and review here. Tuning HF SSB Signals. Tuning HF voice signals (SSB) can be a little daunting the first time around. Here’s a video that shows you how. Using the Wouxun KG-UV3D with TinyTrak4 APRS unit. Provides costs for each item. Interfacing the Byonics TinyTrak4 (TT4) with various handheld radios. Pays special attention to JP8. A presentation I gave at the Nov, 2013, meeting of the Montrose (Colorado) Amateur Radio Club on software defined radio, specifically the FiFi. RS-232 Interface for Windows 7: It works! Cool QSL cards from www.hamtoons.net. Jim is a cartoonist and can make colorful custom QSLs just for you. Here’s the one he sent me. He’s got a cool website worth looking at. 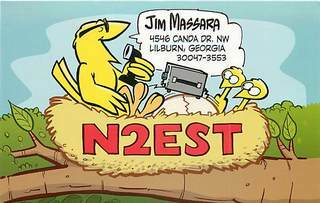 N2EST is a cartoonist and makes custom QSL cards. This is the card he sent me. App to create azimuthal maps based on where you live. Reader Rob, M6KOT, provides this link for those who want to make an azimuthal map based on your location. An azimuthal map shows the direction (azimuth) from your station to any place on earth and is handy if you want to know where to point your beam. Logging and QSLing for the Radio Amateur in the Electronic Age (narrated slide show). I gave this presentation on 20 Feb 2015 at a meeting of the Montrose Amateur Radio Club held in Olathe, Colorado. I added a narration to cover the main points and put it on YouTube. A list of things to bring next year for Field Day! Chronology of ham radio history, used for a presentation given at the Montrose Amateur Radio Club. ACP 131 lists all Q and Z signals. This is my old copy from when I was in the Air Force. I’ve put high-quality scanned, text-selectable pages here. An SET is a Simulated Emergency Test. I tried one out for the first time, and here are my notes to myself. They may help you be prepared too! And here’s Royce’s 2011 entry at the Olathe (Colorado) Punkin Chunkin event! Ham4Ham, a site set up by John Borchers, KC3ASE, for those interested in software development for ham radio. A Montrose Amateur Radio Club antenna repair party. We repaired and upgraded the antennas for Field Day use. 2014 Field Day with the Montrose Amateur Radio Club (video). Near Real Time F2 Layer Critical Frequency (useful for NVIS propagation prediction—if the freq shown on the website is a bit more than the NVIS frequency you want to use, you’re in business. If less, well, try a lower frequency. It’s not that simple. Look in the ARRL antenna book for the formulas. My question is how do you trim / cut it for a different Frequency range? This antenna is designed for the 2m ham band 144-148 MHz, I want to center it in the Railroad range 159.8100 Mhz – 161.5650 MHz. (actually I’m shooting for 160.4100 in my area). I know I can use the formula ” find the minimum SWR Frequency and divide by the desired operating frequency, and then Multiply the present antenna length times the result which gives you the amount you mus remove from the antenna length to give you the desired 1.0:1 SWR at your desired Frequency. Cut 0.597 off of your antenna and you should achieve a 1.0:1 SWR @ 160.5000. So, the question is, do I trim the same amount off of both the short and longer elements, or do I just trim the shorter 19.250 element? Double-check all the connections to look for shorts or opens. The way you describe your system it should work. Have your friend go through it with you–it helps to have an extra pair of eyes. Good luck with the exam! The transistor 1500w amps are new, so I doubt you’ll find much on the used market. They’re pricey. The technology for high powered amplifiers is undergoing change, and there are still some great tube amps you can buy with lots of bells and whistles for less money than the transistor amps. Take a look at the entire field and check reviews. Just a short note to sincerely thank you for your website and the countless hours you have spent making your instructional videos. The ARRL manuals are great but for those of us with a non-EE background, watching your invaluable videos made the lightbulb come on more times than I can count. So many Ah-Ha! moments when a particular concept finally clicks. I really cant thank you enough-I recently passed my Amateur Extra exam and can honestly say I could not have done it without you. You are a true credit to the Amateur Radio Service. Thank you so much and 73s sir! I would appreciate any recommendations you could offer to help guide my selection of a new or gently used amplifier for my Flex Radio 6600 with GPSDO. I am looking for a 1500 W PEP linear solid-state amplifier with automatic tuning that is under $4500. I would like to avoid amplifiers that contain tubes because of the potential difficulty of finding replacements as time goes by. Please let me know if you think of this concern is causing me to overlook some excellent amplifiers. Thank you for your help. Hi Dave, sitting at home going over ques. and ans. for the General exam tomorrow. Thanks to you and a lot of information I’ve picked up on U tube shows I think I’ll be o k. Got the manual just about worn out over the last month. I have a question about a home made J pole ant. I have it mounted about about 20 / 21 feet to the J part. I have a $25 Boufang right out of the box. A friend of mine talked in the yard on simplex with stock ant. and we could talk. I hit the repeater about 12 mi. from the house o k . and could here him on his base. I hooked up to the J pole ( which shows about 1.3 swr) and went through the repeater to his base but could not hear him at all on my radio. I’m wondering if my ant. is not good or the radio is not working any more. I haven’t talked to another ham but him on my handheld. If I get my general tomorrow he will let me borrow a good radio to try it out. Also I will get me a good multiband ant. to set me up a home station. Hope to catch you tomorrow on live chat. Wallace KI5DER, Biloxi, Ms. It looks like you just hit 50,000 subscribers on your YouTube channel. Congratulations, and keep up the great work! Im a new ham already studying for my extra license and your video is what got me to take the next step. I recently purchased a tyt 8000 D.
After my neighbor programmed it the function key stooped working. Please help us reset the radio. Btw I’m a big fan. Dave, I just used your information and that from W4EEY to pass my General. I held a Technical Plus (or at least that’s what it used to be called indicating I passed a 5 wpm code copying test) for many years but wasn’t very active on 2m. Actually I do mostly SWLing. I am on fixed income, so my funds are not infinite and I am careful as to where I spend it. I have found your information to be more than worth my time in helping me in my “ham path”. I just wanted to drop you a quick line and tell you thanks for your many wonderful, informative and educational videos you have posted on YouTube. They have been a great help to me not only in rekindling a long held interest in this hobby but also for the education I’ve received through the Technician and General class license course series. Today I sat for my exam and not only passed element 2 but went on to pass element 3 in one sitting! As I only have just passed the exams today, I have no received my call sign from the FCC yet but I am looking forward to that as well as the Baofeng UV-5Rx3 that I ordered this afternoon. I’m already looking forward to diving into the HF bands soon but I have a little more research to do before that jump (as well as another paycheck or two). I also joined the Lewisville Amateur Radio Association (W5LVC.org) and I’ve already met many wonderful people and gotten a ton of great getting started help there. Thank you again for all you do for this hobby and hope to see you on the air soon. Working my way towards Technician Test next month – Using your videos and the ARRL Manual to study. Do you have any new recommendations for a starter HT radio? The TYT UV 8000E you reviewed looked good. Is it FCC certified? The 8000D seems to be . . .
Is there something newer, better that I am missing? There is so much out there. DMR, GPS, etc. Hi Dave……I can’t afford to purchase a real comm tester unit, way too expensive for my budget. I need a way to generate microvolts for testing radios. I was wondering if using a HF radio (power output 1 watt or so) fed into a variable attenuator (adjustable 0 – 82 dB) and then fed into malfunctioning radio, might work? Would this be safe and also generate the microvolts needed for testing? As long as I can get an acceptable input level, I suppose it doesn’t need to be exact. I just need to be able to trace the signal through the radio. Any other suggestions for doing same would be greatly appreciated, too!! What you are seeing is the factory calibration mode. Contact hfsigs.com using the email address on the page and ask what to do to get it out of calibrate mode. Hi Dave I saw ur video about the bitx40. I’m wondering if u can help me. I put mine together and the display say calibrate when turned on, any ideas what’s causing it. Try one of your suggestions and see how it works. When you have multiple factors present that can affect antenna performance, often your best bet is simply to try things. How are you, Dave? ANOTHER Q for ASK DAVE.. So. our house has a metal roof. on which a short (~1.5 m ) TV-mast is mounted (sans antenna) at its peak, at about the roof’s center; there is also a chimney (not yet used). – a Sloper: HF wire would extend over the backyard, eg, down to 3-conduits, duct-taped together – over their entire length (= 4 m) to form a “DIY vertical support,” secured to a well-planted metal fence-post, w/ guying to keep it from bending / falling L or R, in wind..
BTW, I could replace the 3x conduits with 3x larger-dia. 6 m drainage pipes (also PVC) & similarly duct-taped ’em together, to get the back end up 2 m more than the conduits would. Alternatively: A shorter Inverted-V with its center atop that mast: 1 leg to a tree in front yard; the other to a metal shade-cloth frame, between back of house & back yard. What would you do, in a similar situation? Any other comments welcome. Dave I want to thank you for all of your efforts in advancing the hobby for newcomers like me. I was able to successfully complete all three of my tests, in one testing session, thanks in great part to your training videos. I combined them with hamstudy.org and the ARRL manuals and pass. I have also learned a great deal from your “ask Dave” series. Please keep up the great work and thank you! I used your videos a couple of years ago to study for my technician and general class license. Thanks for everything that you put into those! I know for sure when I decide to work on my extra, I’ll be back for more of your videos! I remembered you are a motorcyclist as well. I saw your video going over Engineer’s Pass. I am back on two wheels myself finally after 10 years of not riding. This time I’ve found myself on a Vstrom 650, and have quickly learned that I want to do more of this adventure riding thing. What better way to combine so many hobbies all into one?! Riding, camping, hiking/exploring, and now I’m adding radio on top of it all. I’m wanting to do things like SOTA, APRS, Winlink, and maybe even limited voice contacts through my Bluetooth helmet system too. Have you done any motorcycle mobile installs, and/or made videos about it? Right now I only have my new Kenwood TH-D74 to experiment with, but I plan on building a com box for the bike with my TM-D710, and eventually a 857d for HF too. Though the HF won’t be a bike mounted antenna, just along for the ride and used as a portable field set up at campsites and the like.